There are so many different kinds of plus sized items out there, but so few super opaques are in this category. 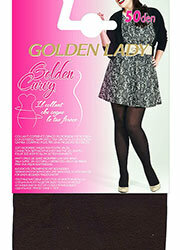 Here are one of the first very thick pair of winter friendly tights that are made for fuller figure ladies. These tights are some of the absolute best at what they do. They are made with rich colours, have a cosy 90 denier fabric and fit up to a UK 34 dress size.